As its brand name suggests, Dazzler Beauty believes that clear and well-hydrated skin forms the foundation for the radiant beauty every woman deserves at any age. 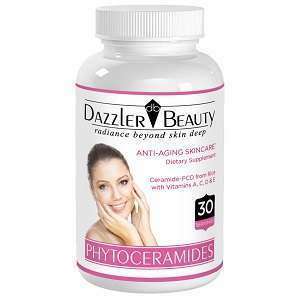 With that in mind, Dazzler Beauty recently launched its first skincare product, a beauty supplement called phytoceramides. Ceramides are naturally occurring lipids (fatty materials) found naturally in skin. These lipids make up about 40% of skin to form the outer layer of the skin structure that allows the skin to retain moisture. The stronger skin cells are, the more moisture they can hold so that the skin will look and feel smooth, soft and supple. As people age, the body produces less ceramides within the skin and loses more moisture, so the skin becomes dry, flaky and itchy. The dryness further contributes to the formation of fine lines and wrinkles. Ceramides pass through cell membranes and can not be stored by the body. If the body does not product enough ceramides due to natural aging, poor nutrition, stress or exposure to harsh environment, the only way to increase the ceramides level is by taking dietary supplements, such as the phytoceramides. Phytoceramides come from plants, including sweet potatoes, rice and wheat. The lipids found in these plants’ oils are identical to those found within the skin’s membrane. Adding these lipids in the diet will strengthen cell structure to allow skin to retain more moisture. Well-hydrated skin tends to regain its elasticity and reduce the fine lines and wrinkles over time. Phytoceramides supplement is a much better alternative to a facelift because it is natural, inexpensive and without the side effects a plastic surgery may bring. It also works better than topical skin cream because it actually restores the skin structure from the inside out for lasting benefits. The product source contains no product ingredient information beyond the fact that this product contains Cermide – PCD made from rice and Vitamins A, C, D and E.
The product source contains no dosage information. A product container contains 30 servings according to the manufacturer which may equal a 1 month supply depending on the dosage taken. $18.45 for a single product container. Each product container contains 30 servings (capsules). The product source contains no information about product returns even for items damaged in shipment. The product source does say that both the product and the manufacturer’s web site are not covered by any warranty but are purchased or used as is. The web site does provide a tool to use to send messages and questions to the manufacturer but provides no contact phone number. With only limited information about this product available including product dosage and even the specific amounts of product ingredients in the product source it is difficult to make a recommendation. The product is not highly expensive but offers no warranty or guarantee or product return policy. For these reasons a prospective purchaser may want a health care professional or skin care expert to review this product before making a purchase or may want to consider another product instead. Jack Webster	reviewed Dazzler Beauty	on February 4th	 and gave it a rating of 2.